Scrub typhus, caused by Orientia tsutsugamushi, is endemic in the so-called "tsutsugamushi triangle". There is a wide spectrum of presentation of the disease ranging from uncomplicated febrile illness to life-threatening sepsis with multiorgan dysfunction. We are presenting a case of scrub typhus causing myocarditis and acute respiratory distress syndrome (ARDS) in an adult female with no previous comorbid illness who recovered fully with prompt treatment in spite of prolonged ventilator support, emphasizng the need for early diagnosis and prompt treatment with antirickettsial antibiotics in a patient presenting with features of scrub typhus. Scrub typhus, caused by Orientia tsutsugamushi, is a zoonotic disease transmitted by larvae of Trombiculid mites (Chiggers). It is endemic to the part of the world called the "tsutsugamushi" triangle extending from northern Japan and far-eastern Russia in the north, to northern Australia in the south and Pakistan in the west. This infection is prevalent in India, especially the southern India, which has witnessed a recent outbreak in Tamil Nadu,  Pondicherry,  and Himalayan region. Scrub typhus has a broad spectrum of clinical manifestations, with most infections being mild to moderate severity. Common complications include pneumonitis and meningoencephalitis, but it can also progress to acute respiratory distress syndrome (ARDS) or acute renal failure (ARF) in severe forms. Cardiac involvement in scrub typhus is very rare which includes minor electrocardiogram (ECG) changes such as nonspecific ST segment, T-wave changes, and premature ventricular contractions have been reported in few cases. Myocarditis has been described as one of the rare manifestations of this infection. We are presenting a case report of scrub typhus with myocarditis and ARDS. A 25-year-old female with no previous comorbid illness presented to us with acute febrile illness and breathlessness for about 15 days. She was initially admitted in ward, her vitals were stable, systemic examination was unyeilding, and she was investigated for fever. In ward she developed worsening of her breathlessness and she was hypotensive which was refractory to fluid therapy. Arterial blood gas (ABG) done at that time was showing severe hypoxia and she was shifted to intensive care unit (ICU). Chest roentgenogram revealed features suggestive of ARDS. In view of impending respiratory failure she was intubated and was put on ventilator support. A central line was placed and fluids were given according to her central nervous pressure (CVP). We noticed an eschar in her right breast. In spite of fluid resuscitation, her BP did not improve and she was started on inotropic support. 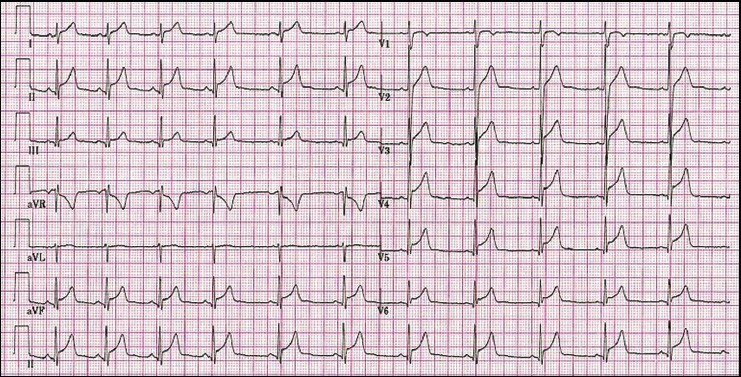 ECG showed sinus tachycardia with diffuse ST elevation [Figure 1]. A two-dimesional (2D)-Echo was done in view of refractory hypotension which revealed global hypokinesia of left ventricle with an ejection fraction of 40%. Her brain natriuretic peptide (BNP) was 2,834, troponin T was 90 ng/L, and creatine phosphokinase-MB (CPK MB) was 48. Patient was positive for scrub typhus serology by enzyme-linked immunosorbent assay (ELISA) technique. Patient was diagnosed to have myocarditis and ARDS secondary to scrub typhus infection as patient had features of myocarditis which include i) severe hemodynamic compromise requiring inotropic support, ii) left ventricular dysfunction demonstrated by echocardiography. Patient was started on doxycycline and azithromycin. Patient continued to be in ventilator support and she required inotropic support. She developed an episode of ventricular tachycardia for which cardioversion was given. After initiation of antirickettsial antibiotics, patient's lung function and hypotension improved. She was slowly weaned of her ventilator and inotropic supports. Her general condition improved and was discharged with minimal exertional dyspnea for which she was advised incentive spirometry. Although myocarditis can be a clinical manifestation of scrub typhus, it has rarely been reported. Some cases with scrub typhus might have undetected mild myocarditis. The only case of scrub typhus myocarditis confirmed by endomyocardial biopsy was reported in 1991 in a Japanese adult in whom heart failure occurred 3 months after an acute febrile illness. Early diagnosis of myocardial complications is crucial. Until our patient developed hypotension, we found no physical warning signs that helped make an early diagnosis of myocarditis. The investigation that might have helped was the ECG which was abnormal prior to hypotension in our case. However, the ECG abnormalities were nonspecific and can be found in one-fourth of scrub typhus patients with no cardiac symptoms. Cardiac biomarkers (creatine kinase-MB and cardiac troponin-T) are noninvasive and highly specific for myocarditis. If available, both biomarkers can be useful in predicting myocarditis. The elevated N-terminal prohormone of BNP (NT-proBNP) level found in our patient is nonspecific, but is a useful tool in assessing the degree of acute left ventricular dysfunction. The outcome of scrub typhus myocarditis depends on adequate hemodynamic support and the early administration of appropriate antibiotics. The mortality rate of acute myocarditis is usually high according to various studies, but cardiac recovery was excellent in our patient. Although the gold standard for diagnosing myocarditis is myocardial biopsy, to perform the biopsy in patients who are severely hemodynamically compromised is invasive and insensitive. The clinical manifestations and the abnormal cardiac parameters (ECG, echocardiogram, and cardiac biomarkers) in our patients were strong evidence for the diagnosis of fulminant myocarditis. 1. McCrumb FR, Stockard JL, Robinson CR, Turner LH, Levis DG, Maisey CW, et al. Leptospirosis in Malaysia. I. sporadic cases among military and civilian personnel. Am J Trop Med Hyg 1957;6:238-56. 2. Kamarasu K, Malathi M, Rajagopal V, Subramani K, Jagadeeshramasamy D, Mathai E, et al. Serological evidence for wide distribution of spotted fevers and typhus fever in Tamil Nadu. Indian J Med Res 2007;126:128-30. 3. Vivekanandan M, Mani A, Priya YS, Singh AP, Jayakumar S, Purty S, et al. Outbreak of scrub typhus in Pondicherry. J Assoc Physicians India 2010;58:24-8. 4. Sharma A, Mahajan S, Gupta ML, Kanga A, Sharma V. Investigation of an outbreak of scrub typhus in the Himalayan region of India. Jpn J Infect Dis 2005;58:208-10. 5. Fang RC, Dennis DT, Lee JB. Electrocardiographic changes in scrub typhus patients. Southeast Asian J Trop Med Public Health 1977;8:503-9. 6. Yotsukura M, Aoki N, Fukuzumi N, Ishikawa K. Review of a case of Tsutsugamushi disease showing myocarditis and confirmation of rickettsia by endomyocardial biopsy. Jpn Circ J 1991;55:149-53. 7. Fried I, Bar-Oz B, Perles Z, Rein AJ, Zonis Z, Nir A. N-terminal pro-Btype natriuretic peptide levels in acute versus chronic left ventricular dysfunction. J Pediatr 2006;149:28-31. 8. Magnani JW, Dec WD. Myocarditis: Current trends in diagnosis and treatment. Circulation 2006;113:876-90.